How to Start a Profitable Blog for Beginners – step-by-step directions to setting up, growing, and monetizing your blog. Start making money doing what you love! 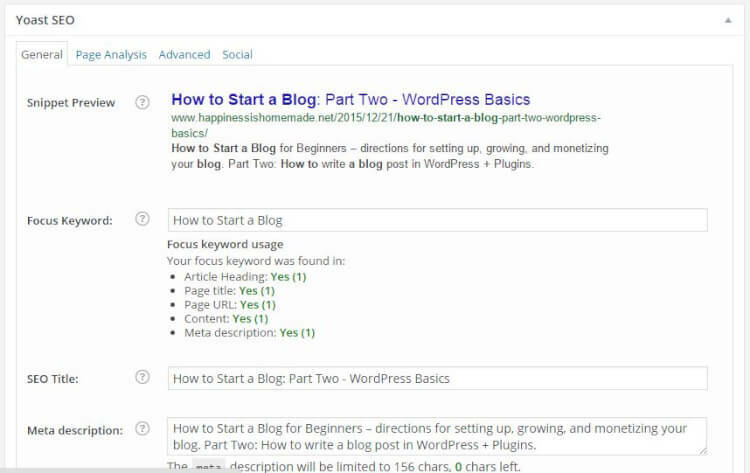 Part Two: how to write a blog post in WordPress and my must have plugins. Welcome to How to Start a Blog: Part Two! In Part One, we recently discussed how to create and set up your own blog, so hopefully you have taken 15-20 minutes to set your website up, and you’re ready to start blogging! Now that you have created your very own blog, you may be wondering, “What next? 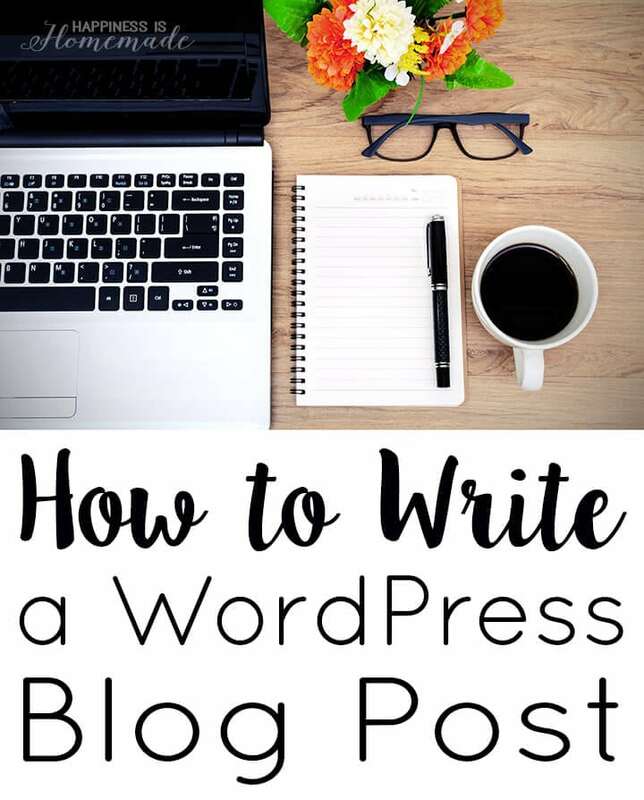 How do I start this thing?” In Part Two, I’m going to teach you the basics of how to write a blog post in WordPress, and I’ll share a few of my favorite must-have WordPress plugins. 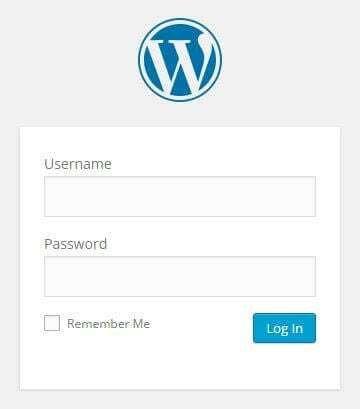 Log in to your WordPress dashboard by going to www.YourBlogAddress.com/wp-admin and logging in using the credentials you created in Part One. There are several different ways in which you can create a new blog post (indicated with red arrows in the image above). From the WordPress dashboard menu, navigate to Posts>Add New -OR- click on “+ New” in the top menu bar, and select “Post” from the drop-down menu. The “Add New Post” page is where you compose your blog post. Give your post a descriptive title that clearly conveys what the post content is about. We’ll delve more deeply into SEO later, but one of the key points is that using brief descriptive text in your title and at the beginning of your post will allow search engines to better index your blog (and you’ll reach a larger audience!). To add photos to your post, click on the “Add Media” button above the text tool bar. Clicking “Add Media” opens up the “Insert Media” pop-up window which contains your entire media library (all previously uploaded images, files and videos). To upload new photos or media, click on “Upload Files” (the red arrow on the image above), and select the files to be uploaded from your computer folder. In the Insert Media window, select the photos that you want to include in your blog post, and click on the blue “Insert Into Post” button on the bottom right corner. Finish writing your blog post, and be sure to click “Save Draft” (in the right side menu bar) from time to time! The right hand sidebar contains a few important final steps that you need to complete before publishing your blog post. First, let’s talk about the “Categories” and “Tags” tabs. Categories and tags are how you organize and index your blog content. Categories are the larger and more encompassing topics (such as recipes, crafts, holidays) and tags are keywords and smaller sub-categories that readers might use to search your site for something specific (such as dessert, chocolate, dinner, cookies, etc.). In other words, if your blog were a book, categories would be the chapter titles, and tags would be the words in the index at the back of the book. 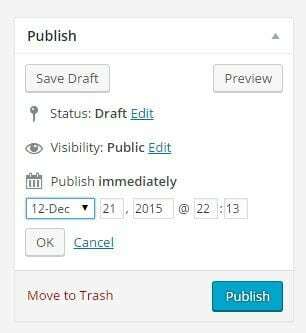 When you have finished editing your post, you may push the blue “Publish” button to send your post live immediately, or you can opt to schedule your post to go live at a specified future date and time. To schedule your post, click on “Edit” next to the words “Publish: immediately.” A secondary menu will appear, and you are able to specify the date and time that you want your post to be published. Note: WordPress uses military time, so if you want to schedule your post to go live in the PM, you’ll need to convert the time. Once you have selected the date and time, click “OK” and the blue button will read “Schedule” instead of “Publish.” Click on Schedule, and wait a moment to receive the confirmation that your post has been scheduled. Congratulations, you just wrote and published/scheduled your first blog post! 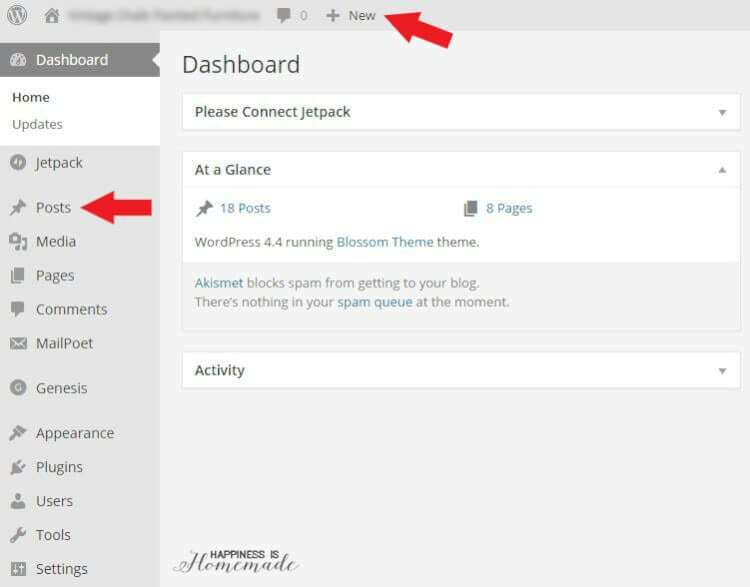 Use the WordPress dashboard to navigate to Posts>All Posts to edit your post at any time. Select the post to be edited by hovering over the post title, and selecting “Edit” from the pop-up menu that will appear underneath the post title. Plugins are a way to add functionality and style to your blog, and they are one of the top reasons why WordPress continues to reign supreme in the blogging world. Plugins can protect your site from hackers, create gallery slide shows, build your newsletter subscriber list, and share your post on social media or with your friends – seriously, there’s a plugin for everything! There are SO many plugins available that the number of choices can become overwhelming, so I’m giving you the lowdown and sharing my ten favorite plugins that I think every new blogger needs! UpdraftPlus (Backup and Restoration) – you absolutely must backup your blog on a regularly scheduled basis, and UpdraftPlus does a reliable job. It automatically backs things up and makes it easy for you to restore a previous backup if necessary. The premium version gives you more backup options, but I’ve found that the free version works well enough for my needs. Google Analytics Dashboard for WP – track your pageviews and more with this plugin that integrates your Google Analytics data into your WordPress dashboard. Akismet – spam comments run rampant on blogs, so using a spam blocker like Akismet to filter out the garbage is a necessity! Akismet has caught and discarded over 45 thousand spam comments from Happiness is Homemade in just the past six months alone! Comment Reply Notification – this plugin sends an email to your readers when you reply to their comments left on your blog. WordPress Popular Posts – easily create a gallery or list of your most popular posts to display on your sidebar or footer. Lots of customization options! Flare – you’ll need a social sharing plugin, and there are LOTS to choose from. I am currently using Flare, and I love that it has an extensive dashboard that enables me to track all of my social shares. jQuery Pin It Button for Images – adds a Pinterest pin-it button that appears upon hovering over your post images. Allows custom icons and graphics to be used for the button. Related Posts by Zemanta – share “related posts” at the bottom of your screen, and allow readers to quickly see related content and ideas. Great for reducing bounce rate and keeping readers on your site! Yoast SEO (formerly known as WordPress SEO by Yoast) is the ultimate all-in-one search engine optimization (SEO) tool. Easily optimize your post title and meta description, and analyize keywords all on one simple screen. To install any of these plugins, download the .zip file from the links above. Navigate to Plugins>Add New in your WordPress dashboard navigation. When the “Add Plugins” page loads, click on the box right next to those words that says “Upload Plugin.” Select the appropriate .zip file, and continue clicking the prompts until the plugin is installed and activated. That’s it for How to Start a Blog: Part Two! Next week I’ll be sharing the #1 key to successful blogging and 10 things that EVERY post must have, so be sure to check back! Yoast works perfect. I am using SEOPressor along with it, helps in optimising multiple keywords. Thank you for this tutorial, though. It covered all the points. You know, the sophisticated tutorials the SEO and WordPress sites have. I doubt the newbies get all that. Thank you so much for these plugin ideas! I’m just starting my blog, and these are exactly what I’ve been looking for! 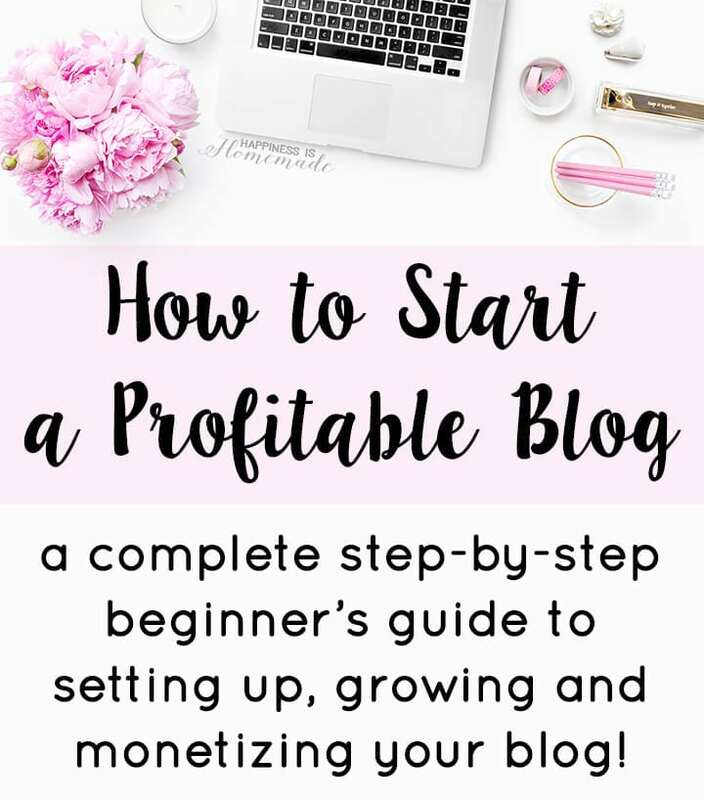 The posts on starting a profitable blog has been very helpful! I am interested in starting a blog and was just curious if you had a few blog posts already written to post when you launched your blog or if you just posted one post when you started your blog? How did you decide what your first post would be about? Love these posts! However, I’m having trouble finding my plug-in option on my dashboard. Is there something I did wrong in the process? Hi Stella, are you running the correct version of WordPress? They are only available for users who are on self-hosted WordPress.org blogs. Thanks for the suggestions!! I just started a blog and this is very helpful because looking at all of the plug ins is so overwhelming at first. So this may seem like a “duh” question BUT I am so new to this! I was wondering how I post under a certain category. Like under my “DIY+Crafts” option how do I post there instead of posting straight to the home page? Thank you! This has all been SO SO helpful! Such good information! Thank you!! Awesome tips for beginners like me! Thank you! Great post! It was very refreshing. I love your approach of finding your audience, figuring out their problem and then giving them a solution. I’m just about to start my own blog, and this method seems extremely important. I can’t wait to apply it! I have been blogging for a couple months now and did not know you can schedule when you posts go live. So many informative information and great tips. Ive been looking for a plugin for help with SEO. Im going to try the one you recommended. Thank you for sharing! This post has been soooo helpful. I’ve been struggling to figure out which plugins are a must and this is exactly what I needed!